Public communication, education and awareness-raising on the vulnerability of the marine and forest ecosystems and the importance of sustainable tourism are key pillars of CHICOP’s Environmental Education (EE) programs, which are regularly conducted on Chumbe Island and in Zanzibar. “……..A notable example of payments for ecosystem services within the context of coral-reefs habitat is provided by the private and non-profit Chumbe Island Coral Park in the United Republic of Tanzania… local fishermen benefit from the Reef Sanctuary, as research findings confirmed that fish inside the protected no-take zone travel out and increase their yields in the vicinity”..
From aid project manager to social entrepreneur, founder and director of Chumbe Island Coral Park (CHICOP), Ms. Sibylle Riedmiller, followed her passion for the underwater world when she began efforts in 1992 to create the world’s first privately-managed marine protected area at Chumbe Island in Zanzibar, United Republic of Tanzania. This hitherto uninhabited small coral island 12 kilometers southwest of Zanzibar town is now a fully managed nature reserve that protects a 30-hectare no-take coral reef sanctuary, where fish and corals thrive, and a coral-rag forest reserve covering most of the island's 22 hectares that harbors rare and endangered animals. Over the last two decades, CHICOP has created a model of financially, ecologically and socially sustainable Marine Park management, where a collaboration of actions for sustainable coastal tourism supports employment, conservation, research and environmental education for local people. Currently top ranking on TripAdvisor.com (a traveler information and feedback website portal) gives evidence that Chumbe Park has also become a successful sustainable tourism destination, where income from visitors is channeled back into preserving this little stretch of paradise for future generations. Maintaining the integrity of the island's pristine ecosystems for posterity is CHICOP's mission. In this regard, not a single tree was cut and only empty clearings left by nature were used when the Visitors' centre and seven eco-bungalows were built. Combining traditional building styles and materials with modern eco-architecture, the technologies for water and energy provision and waste avoidance and recycling of the eco-lodge took full advantage of sunlight, natural ventilation and rainwater, with rainwater catchment, vegetative gray water filtration, composting toilets, solar water heating and photovoltaic power generation. 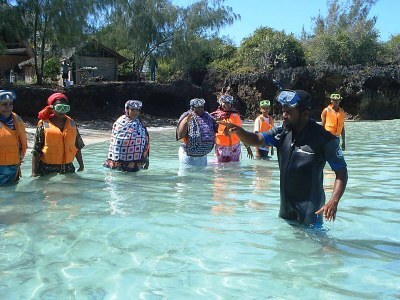 The Chumbe model of sustainable tourism that develops and funds a marine park and provides benefits to local people has generated major interest among international conservation organizations and has won CHICOP numerous prestigious awards and global recognition. In the year 2008, CHICOP became a founding member of the flagship program of the Jochen Zeitz Foundation, the “Long Run Initiative[i]". This initiative promotes and certifies tourism enterprises, which directly manage, or significantly contribute to the management of a natural area of conservation value and demonstrate their commitment to sustainability through the 4Cs: Conservation, Community, Culture and Commerce. Performance and processes across the 4Cs are assessed through a certification scheme that awards destinations with the Global Ecosphere Retreat (GER) distinction for the highest level of sustainability. In working towards this certification, CHICOP shared and discussed achievements in a challenging environment and lessons learned in the two decades of Chumbe history. 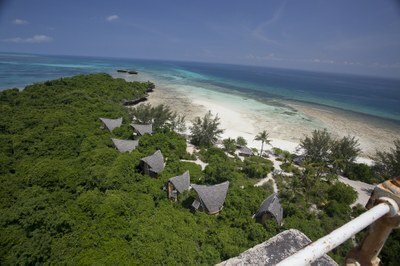 After going through a rigorous assessment process by external experts, CHICOP become the first GER certified Long Run Destination in 2011, in recognition of promoting marine conservation in Tanzania and setting an example for genuine sustainable tourism and environmental education and awareness creation. Chumbe Island Coral Park is a private investment into marine and forest conservation with a commercial component, the eco-lodge, which generates the income needed to run the park. Therefore, revenue generated from tourism is reinvested in supporting park management and environmental education programs. This includes various economic incentives for local communities since the lodge opened in 1998. Employment and career opportunities: The successful integration of environment and community is an important benchmark for sustainable tourism. In order to realize this as a fully managed nature reserve, and also due to the particular eco-technologies installed, CHICOP’s operations are very labor-intensive. With only seven rooms, CHICOP has probably the highest employee/room ratio of any tourism business in Tanzania, and three times the international average for eco-lodges. Wherever possible, CHICOP employs people from nearby village communities, though they have limited formal education and thus need much on-the-job-training. Of the 43 employees, 95% are Tanzanians, over two thirds from local communities, and 5% expatriates. In particular, former fishermen were recruited and trained as park rangers and stationed on the island. Gender considerations are also key, with women being given preference and currently forming 40% of the entire Chumbe workforce. It is important to note here that a third of the staff are directly involved in conservation management and education. Market for local services, produce and handicraft: Since guests are offered typical Zanzibarian cuisine, which is a delicious blend of Asian, Arabic, African and European traditions, CHICOP creates a ready market for local produce, rather than imported foods. This not only reduces waste and pollution by minimizing packaging materials of industrially processed food, but also raises awareness and pride for the local culture. Other income opportunities for local people include building materials for the eco-lodge, handicrafts sold in the boutique, the outsourcing of road and boat transport and craftsmen services during maintenance. Sustainable financing for conservation: The sustainable management and promotion of key ecosystem services (sustainable fisheries and biodiversity conservation) for the Chumbe region has been widely recognized, including mention in the recent UN Secretary General’s report to the General Assembly on protection of coral reefs for sustainable livelihoods and development for Rio+20, which states: ‘‘A noted example for PES (Payment for Ecosystem Services) within the context of coral reefs habitat is the private, non-profit Chumbe Island Coral Park Ltd (CHICOP) in Tanzania…. Especially local fishermen benefit from the Reef Sanctuary, as research findings confirmed that fish inside the protected no-take zone travel out and increase their yields in the vicinity”. 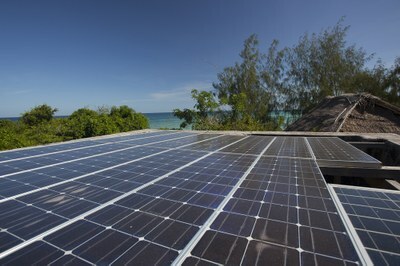 One of CHICOP’s main objectives is to manage the eco-lodge as a model for sustainable tourism development, providing high-quality services to visitors while promoting environmental awareness through education programs for the local community and all island visitors. Like many developing countries, Zanzibar does not have an effective/efficient solid waste management system in place. Due to lack of infrastructure and public services, waste is burned in the streets or dumped in illegal sites, creating major public health concerns and environmental hazards. To minimize environmental impacts, CHICOP restricts the number of visitors to the island and avoids the purchase of non-biodegradable products. Where possible, goods are sourced locally and transported in locally made, biodegradable baskets. Non-cooked fruit and vegetable waste is collected, composted and used for the composting toilets on the island, while non-biodegradable waste is removed from the island and, where possible, recycled. Only biodegradable detergents and soaps are used and laundry is washed off the island. During the year 2012, CHICOP also conducted waste recycling workshops with the help of volunteers, who for example taught local staff how to turn candle stubs from guest dinners into recycled coconut candles. Workshops were held to create hands-on learning tools for visiting students using only recycled materials to illustrate how trash can have a ‘second life’. Such activities illustrate CHICOP’s commitment to environmental sustainability and the commitment to share knowledge and the importance of waste management through practical learning experiences. While coastal communities depend on fishing for their survival in mainland Tanzania and Zanzibar, there is little evidence of traditional reef management or sensitization about the limitations of this fragile resource. By and large, Government policies, legislation and management capacity fall short in meeting the challenges of rapid environmental degradation and tend to favor investments into unsustainable development and environmentally destructive products and practices. Therefore, public communication, education and awareness-raising on the vulnerability of the marine and forest ecosystems and the importance of sustainable tourism are key pillars of CHICOP’s Environmental Education (EE) programs, which are regularly conducted on Chumbe Island and in Zanzibar. The programs offer free island excursions, training workshops and peer education sessions for students, teachers and community members. Based on the approach of ‘Education for Sustainable Development’, these programs help to close the gap between theoretical knowledge and practice, involve different level of learners and seek solutions to environmental concerns that build on indigenous knowledge, culture and traditions. By the year 2012, over 6000 school children and 900 teachers had visited the island to experience the natural environment with its diverse ecosystems. The experiential hands-on activities for schoolchildren and all visitors include guided snorkeling in the reef and walking along the forest trails using all senses such as sight, touch, hearing, taste and smell while ensuring that the teaching contents link up with the national school curricula. CHICOP also supports schools through environmental talks/seminars and helps organize environmental clubs, which are much encouraged by a popular competition for a sustainable future for schools, i.e. the Chumbe Challenge Environmental Award. The role of research and education: CHICOP started operations in 1991 by conducting baseline surveys of the ecosystems and marine and forest flora and fauna of the island. This was meant to establish the conservation value of the Chumbe reef and coral-rag forest and to convince the Government of Zanzibar that the island should indeed be protected. However, it was clear that the park could not be developed without co-operation of local communities as well. Research and training on marine and forest conservation and sustainable tourism development for income generation was therefore at the center of project implementation. Enforcement of no-take marine parks is challenging around the world, especially when local communities rely on fishing for their livelihood. On the other hand, after a few years of effective closure, the local fishermen benefit from marine parks, as these create breeding sanctuaries for fish and other marine organisms, which restock adjacent and upstream overfished areas, the famous 'spill-over effect'. This was discussed by the CHICOP management in village meetings in the early nineties to win co-operation, and it was agreed that fishermen should be employed and trained as Park Rangers to educate their fellow fishermen about the purpose and benefits of the closure. This approach worked very well. As soon as the spill-over effect became noticeable in the mid nineties, enforcement was no problem anymore, and local fishermen now respected the park boundaries and reported that the catch outside of the boundaries had increased since the establishment of the park. Some of the fishermen were trained in data collection for research, park management and monitoring techniques for the reef and the forest to become park rangers. They also learnt the English language and guidance skills required for island visitors, including environmental education for local schoolchildren. All other island staff, such as cooks, cleaners & waiters are also trained periodically to acquire the basics of reef ecology, forest ecology, English language skills, eco-tourism and eco-technology. Capacity building of government staff: CHICOP has also helped to raise conservation awareness and understanding of the legal and institutional requirements among government officials. The very innovative and unusual investment proposal of a privately established and managed Marine and Forest reserve required the involvement and approval of altogether seven Government departments. This took over four years to negotiate, followed by intense discussions on the Management Plans 1995 - 2016, which were developed by CHICOP consultants with wide stakeholder participation. This lengthy process has gained CHICOP political support and prepared the ground for improvements in the legal framework for marine conservation, environmental protection and management. Furthermore, an Advisory Committee that was established in the year 1995 includes village leaders, government officials, local academics and the CHICOP management, and meets at least twice per year for discussions about achievements and challenges. From our work in Chumbe, through lessons accumulated over a period of 2 decades, we have established that private management of marine protected areas can be effective and economically viable, even in a challenging political environment. Investment in conservation and in environmentally sound technologies, as well as the employment of additional staff for park management and environmental education programs, raises costs considerably, making it difficult to compete with other tourism enterprises. Favorable conservation and investment policies and taxation would encourage such initiatives, but are not currently available in Tanzania. Close cooperation with government agencies in establishing and protecting this reserve has enhanced the understanding of environmental issues among local and national authorities. In addition, the establishment of the Chumbe nature reserve has benefited local communities by generating income, employment, market for local produce, developing new work skills, and restocking commercial fish species in adjacent marine areas (spill-over). To avoid user conflicts, it is easier to preserve an area that is not used intensively for subsistence or other economic endeavors by local communities. With the threats of climate change, marine conservation needs more political support from governments and the international conservation community, as well as recognition of the contributions that the private sector can make to both, effective conservation area management and livelihoods of local people on the ground. Long-term security of tenure and contracts, together with a favorable political, legal and institutional environment are needed to attract more private and community investment in marine conservation particularly in the developing world. The Chumbe Island Coral Park project looks forward to sustain these in the months and years to come. Some of the most prestigious of the approximate 20 of international awards won by CHICOP from 1999 to date include: 1999 British Airways Tourism For Tomorrow Award - Global Winner; 2000 Global 500 UNEP Outstanding Environmental Achievement Award – Winner; 2001 Ecotourism Destination Award - World Winner; National Geographic Society’s Center for Sustainable Destinations (CSD), 2012 Sustainia Award; among others.